Pittsburgh's Jim Marczak might be party to the bi-national initiative to reduce the border drag on the mega-regional economy, which would explain the EriO and GLEI references. States, provinces, and localities all have parochial and unconnected economic development plans to capitalize on their waterfronts. Existing bi-national organizations charged with Great Lakes stewardship are either focused solely on water preservation or too hamstrung by their particular organizational history and politics to focus on regionwide water-based economic development. I have had several recent conversations with some of Pittsburgh’s self-identified regional taxonomists who disagree with GLUE’s categorization of the burgh as a Great Lakes city. I will be the first to admit we are not dealing with a cut and dry categorization here. Longworth wouldn't extend his Midwest region to any part of Pennsylvania and as Abby notes, most of Pittsburgh would agree with him. Pittsburgh is a Great Lakes city thanks to one degree of separation, the urban link with Cleveland. Cleveburgh is an easy and obvious connection to draw. The problem is invoking the Great Lakes as the regional touchstone. When studying the coalfields of Appalachia, it is also beneficial to take a look at the area that was one of the biggest destinations for Appalachian coal during the golden age of coal mining: The Industrial Heartland (called by some the Rust Belt). This is a region that centers around the Great Lakes and the Ohio River, both of which supplied the river transporation that gave the area's industries an advantage. The Rust Belt was also once endowed with ample rail transporation. While that may still be true, the steel rails on many lines have been removed. 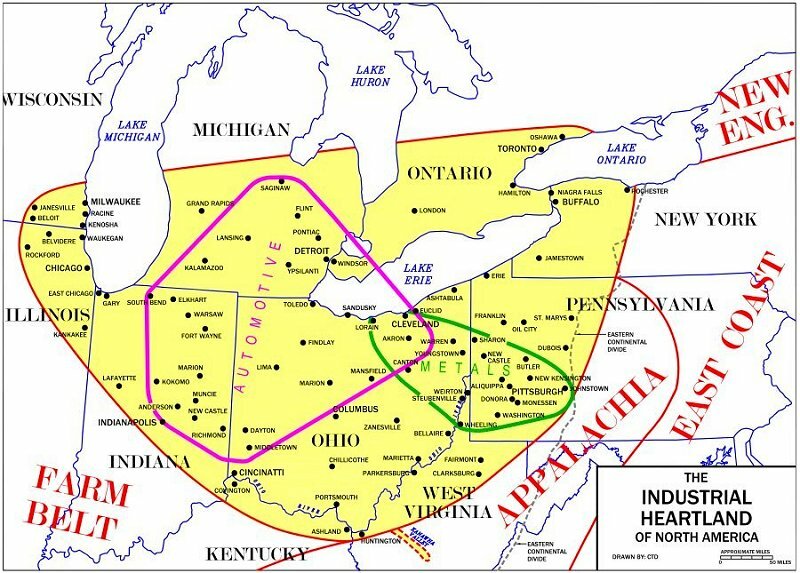 Appalachian coal was transported by these means to the steel mills of Pittsburgh and Chicago, automobile factories in Detroit, electrical power plants, and various manufacturing plants such as the International Harvester or Firestone. The Industrial Heartland attracted a huge number of immigrants from 1890-1930. The Polish came in droves, especially to Pittsburgh and the Chicago-Milwaukee area. Italians immigrated also, explaining why eight of the 24 Mafia families in America were located in the region. Some other immigrants were Irish, Greek, Slovak, Slovenian, Lituanian, and Hungarian, among others. African-Americans came from the Southern U.S. looking for opportunity as well. All of these people were added to the German and Scots-Irish population that was already present in the area. Echoes of this diversity in the Industrial Heartland today are heard in radio shows and various festivals. The Postindustrial Heartland shares economic, political and social geographies. There is no need to remake the wheel and construct a new regional identity. The former comparative advantage of proximity to water transport is well documented and Tech Futures Chris Varley re-emphasized this perspective in moving Northeast Ohio forward. If you think of the Great Lakes as the other Ohio River, then the mega-regional connection is quite obvious. YOUNGSTOWN, Ohio -- The Youngstown/Warren Regional Chamber announced this morning that one of its executives took part in a conference last month that crafted a five-point economic policy agenda for the Great Lakes region. 1. Create federal transportation infrastructure policy and funding that supports the unique needs of inland metropolitan regions that today operate as global gateways and centers of trade and commerce. 2. Construct a 21st century border with Canada that balances national security with economic security through accelerating bi-national economic advantage in the movement of goods and people. 3. Establish federal immigration policy that facilitates international talent attraction, integration and retention driven by the assets and needs of the Great Lakes Region. 4. Build a Great Lakes innovation strategy that fuels research, development and commercialization activity in key industrial sectors. 5. Renew and leverage the Great Lakes by supporting business development and research opportunities compatible with fresh water technology and water-based development, while protecting and improving both the supply and the quality of water. Complete the proposed Great Lakes Restoration plan pending before Congress. Summit participants worked on the Great Lakes agenda based on analysis of the Midwest economy by the Brookings Institution Metropolitan Policy Program, Paglia said. A follow-up summit will take place later this year with members of Congress representing the Great Lakes region, he added. Collaborative Innovation Center at Carnegie Mellon. A reception will follow at the Intel Lab upstairs. I hope you will be able to attend. -Prof. Seth Goldstein (Claytronics Project), "The Future is Programmable"
-Prof. Latanya Sweeney (Data Privacy Lab), "Fast Capture of Fingerprints"
-Jeff Mullen (DYNAMICS), "Eliminating Credit Card Fraud"
-Matt Harbaugh, Jim Jen (Innovation Works), "Launching the AlphaLab"
The UWM Department of Urban Planning is pleased to announce details regarding its 2008 Charles Causier Memorial Lecture. Mr. Richard C. Longworth will present a lecture at UWM entitled "A Punch to the Middle: Globalization and the American Midwest," on Friday, April 4th from 7:30 - 8:30 pm. Mr. Longworth’s upcoming lecture at UWM will focus on how globalization is transforming the American Midwest, and how the Milwaukee region is addressing the challenge. New global forces are turning both heavy industry and farming upside down, undermining old factory towns and rural areas, destroying old jobs and bringing in new immigrants, putting new demands on education, on government, and on Midwesterners themselves. All this is happening with lightning speed, in a region that prizes stability. Mr. Longworth will address how the region is currently coping with globalization and provide insight into how the Midwest can adapt and prosper. This country needs major reform in how it imports professionals. The limits on our ability to bring in international recruits has hampered our opportunities to grow, which means they have hampered the opportunity for Pittsburgh and Allegheny County and the commonwealth of Pennsylvania to grow, as well. Another factor to consider is how we market the Pittsburgh region. I've suggested an "EriO" initiative. It's similar to the Great Lakes Economic Initiative that involves combined economic development efforts by states around the Great Lakes, including Pennsylvania. The EriO concept draws on that idea, except that it brings together the American states and the Canadian provinces that border Lake Erie and Lake Ontario. We would pool our resources to bring new companies to this expanded region and work on ways to simplify border restrictions so that goods and people could cross seamlessly, without jeopardizing national security. They do it in Europe -- why can't we do it here? Many of us already are working on a plan to make this happen. One such spark in the 2006 tour ignited a major change in direction for one German company, Sycor. Headquartered in Goettingen, Germany, the information technology and business process consulting company was weighing where to locate a North American headquarters. Pittsburgh, which had a small Sycor office, was a candidate but it was running behind some other cities. "By the time we got the e-mail from Allegheny Conference that the tour was going on, we were already leaning toward Montreal," said Jim Marczak, CEO of Sycor Americas. Then a Sycor representative attended some meetings as well as a PSO concert in Dortmund and was blown away. "[He] instantly called me to say how wonderful it was," says Marczak. "He is a classical music lover and it struck a nice chord with him." Soon enough, Marczek opted to negotiate with the Pennsylvania governor's action team and Allegheny County for an incentive plan of $440,000. "It was pretty close to the Canadian offer," he said. "Because of the intangibles, we chose Pittsburgh." Seems to me that Mr. Marczek is committed to making Pittsburgh into the kind of city that will help his company be a global success. I would think that what is good for SYCOR is good for Pittsburgh and the Post-Industrial Heartland surrounding the Great Lakes. I hope to find out more about EriO. Can I get Jim Marczek together with Richard Longworth and Richard Herman? In this world, CNN, BBC, New York Times and Washington Post will be among the leaders in the global information market. Local newspapers ... at least those who have already established themselves as a "local source" and understand the transition to new media ... will take the lead in the local news markets. Unfortunately, Mr. Longworth, in this world there will be no room for "regional newspapers," and their only choice will be to focus on being the local news leaders. This doesn't mean they still cannot do great analytical journalism, bringing global issues to the local level. It does mean, however, that no matter how big or small, a newspaper can no longer be all things to all people. Perhaps this rebuttal to Longworth's suggestion makes sense to media wonks, but the use of geographic scales is confused. A regional economic newspaper is not a local source trying to "be all things to all people." Longworth sees an opportunity for a publication to sit between your daily local and the "global information market." I think Longworth is right and I'll provide an example of the niche that could be filled. About two months ago, "locals" upbraided a Financial Times reporter for typecasting Erie, PA. While the Erie Times-News won't be noticed for excellence in international reporting any time soon, global and national coverage will still struggle to get the hometown story right. What's missing from the overall picture is a useful piece concerning the relationship between any Rust Belt shrinking city and globalization. Ramit Plushnick-Masti, a reporter for the Associated Press, writes the kind of stories I have in mind. But Plushnick-Masti's beat, she is based in Pittsburgh, is still too small. And the global media is not intimate enough with the regional geography to capture local travails with globalization. Instead, we continue to get stock stereotyping (The Economist being a notable exception). Furthermore, decent coverage is likely to be too sporadic to engage a more serious and dedicated readership. Longworth's goal is to facilitate a regional knowledge exchange about dealing with globalization. The geographic scope of the newspaper would be unique, neither a local nor a global outlet. Claiming that local papers can't do everything completely misses these points. If anyone needs to get with the times, it is Richard Klicki. As costs rise and Williamsburg feels more and more like the Upper West Side, older industrial cities in the Upper Midwest are becoming increasingly attractive to artists of all stripes. Toledo, Cleveland, Erie, Detroit - you name it. Sticky cities are making waves with industrial space that has been adaptively reused by artists who want to live and work there. Are we the new Brooklyn? GLUE enthusiast, Cleveland lover, and arts advocate Seth Beattie put together “From Rustbelt to Artist Belt” to answer just that question. OK, it’s a little less simple and lot more substantive. Seth and hundreds of artists and arts advocates (like you) from across the region will spend the day discussing strategies to attract and support artists in our hometowns. If you are a fan of GLUE, you are a fan of this event. You must not have known it’s two for the price of one. New Brooklyn? I'd settle for the New Philadelphia. Is anyone planning a paper that would do that? I asked him. “The answer is no,” he replied. “So we’re left to speculate on how one could begin. . . . Here’s a potentially money-making idea. The Tribune could launch a Midwestern newspaper, a sort of regional [Financial Times] that covers both the Midwest and the globe with true quality journalism, and would work hard to link the Midwest to the globe. It would be smaller in size, with considerably higher newsstand and subscription prices, less reliant on advertising, devoid of the kind of Dear Abby features that bring in readers now. . . . This would be an elite paper, sure. But it would inject global knowledge into a region that desperately needs it. And who knows, it might be read by local editors and reporters who could be inspired to do some of the same sort of reporting on their own back yards." A regional newspaper covering globalization? Sign me up. By now you've probably seen the news about Pittsburgh being ranked #2 for growth in Venture Capital investments. This is great news for a number of reasons, not the least of which is putting our region 'on the radar' across the the entrepreneurial community in the US and around the world. Help Startups has known for some time that our region is poised for explosive growth, driven by the strength of our dynamic entrepreneurial community. While neither, "Here we go, entrepreneurs, here we go! ", or "Let's go entrepreneurs" have the same ring as "Here we go, Steelers, here we go! ", or "Let's go Pens! ", the sentiment is the same. As I asked in a recent post on the Pittsburgh Today web site, "Have you hugged an entrepreneur today?" Entrepreneurs are the engine that will make Pittsburgh a major success story in the early years of the Twenty First century. Thirty years ago we were known as the "City of Champions", and those days are about to return! There are many kinds of leaders from all walks of life, but how does one define the qualities they all share? What inspires, what drives, what challenges someone, anyone, to become a leader? Our leaders don’t all look the same. The Essence of Leadership will ask a diverse group of leaders to reveal their drive, passion and goals to you, our audience. Lindsay Hyde was just a Harvard Freshman in 2000 when she founded Strong Women, Strong Girls, Inc., a mentoring program that works to inspire young women to change the world. The Honorable John Fetterman fell in love with Braddock, PA as an Americorps volunteer in the 1990’s and came back in 2001 to found a program that serves the dislocated youth there. In 2005 he ran for, and was elected, mayor, and has since used that position to inject creativity and artistic influences into this blighted community. Mickey McManus leads a highly interdisciplinary team in a uniquely creative business model, as President and CEO of MAYA Design. During his 11 years on Pittsburgh’s City Council, our moderator, Sala Udin, became known as the voice for the underserved and disenfranchised. And now, as the president and CEO of the CORO Center for Civic Leadership, Sala’s role is to coach young people to become effective and ethical leaders in the public arena. The Essence of Leadership event kicks off our new ongoing Leadership Salon Series, a monthly series of smaller, more intimate events that we hope will both inspire new leaders and allow you to network with an amazing group of local movers and shakers who have defined what it means to take a leadership role in their field or community. Bring your questions, ideas and bring your energy! Cocktails and conversation to follow. The following are high level notes of Tom Churchwell’s speech discussing venture capital at The University of Chicago Graduate School of Business (Chicago GSB). This talk took place in Chicago on January 22, 2008. I’m posting it today in celebration of this week’s Midwest Venture Summit. If we do not make changes to the H-1B program, foreign outsourcers will continue to import thousands of foreign workers to the detriment of U.S. businesses and workers. I urge you to look at the reforms in the Durbin/Grassley bill, S. 1035. For example, we would require all H-1B employers to make a good-faith effort to recruit American workers before hiring an H-1B visa holder. Raising the H-1B cap without this and other reforms will only hurt American companies and workers. Reforms, increased enforcement, and better transparency will help put integrity back into the program. I hope you will consider these views and share your thoughts with me so that our immigration laws can be reformed for the benefit of U.S. companies, workers, and taxpayers. Senator Grassley will support a visa cap increase only if his reforms are enacted. Grassley is doing his job, making sure American interests are protected. But will his suggested additional regulations accomplish this noble goal? Are the changes to US immigration law even necessary? Grassley's premise is that more H-1B visas will undermine the US economy and increase unemployment. That point is debatable, but I see an opportunity in Grassley's protectionist rhetoric. First, some of Grassley's reforms are relatively benign and would help draw more citizen support for the program. Simply stepping up the enforcement of the laws in place would help repair the eroding public trust in border regulation. Second, Grassley wants to trade a cap increase for immigration reform that obviously benefits Americans. Saudi Arabian economics junior Abdulaziz Alsalim isn't graduating this year, but he already decided he won't be looking for a job in the United States. "It's complicated," he said. "It's not as easy as a person who has a green card." Alsalim said it'll be difficult to find an employer who can offer a job specific enough for his economics degree. More than half of the University's international students pursue technical and business degrees, Schneider said. "They want more marketable fields to get a job in their home country or in the U.S.," he said, adding that it might be more difficult for international students to get jobs in the United States when their H-1B permits require major-specific careers. "I have to go back," Alsalim said. "There is not many options when you're an international student." Highly sought after human capital will stay in shrinking cities if that's where the H-1B opening is located. The idea is to designate the Rust Belt as an area of deregulation, thereby attracting businesses interested in the skills of local college graduates. Also, regional colleges and universities will attract more students from all over the world and help mitigate the demographic trough just starting to move through. Part of the program could be retraining the local workforce for the new jobs that will arrive thanks to the H-1B visa reform. Of course, American workers now residing in boom states will boomerang back, but there will likely still be a shortage. Richard Idem Somiari exemplifies the new type of businessman Johnstown can attract. He looks at the slow-paced town he lives in today and longs for his Nigerian hometown Port Harcourt, where oil refineries spew smoke alongside peddlers hawking wares from headborne baskets. But then he recalls the $1.8 million in low-interest loans, grants and aid he received from Johnstown to bring his promising ITSI Biosciences company to the city's business district. He thinks of the money he is saving running his enterprise from Pennsylvania's Laurel Highlands rather than from London or New York. In the seven years Somiari has been in Johnstown, he has watched the slow transformation. Somiari's world view is the perspective required to rebuild the Rust Belt. Johnstown is not competing with DuBois, Erie, Pittsburgh, or Cleveland. The comparative advantage concerns the landscapes of alpha world cities and developing countries such as Brazil or Chile. The Postindustrial Heartland must offer substantially reduced opportunity costs for innovation. Places such as Youngstown can become home to America's informal innovation economy. One more lesson from Johnstown: The game is to attract human capital, not retain it. Update: Null Space beat me to the punch. We see a growing understanding in Michigan and the Detroit area that the path to prosperity is about people getting fundamentally better educated than the previous factory economy demanded of them. It also means diversifying the economy to exploit new areas of opportunity in energy, design and engineering, freshwater technology, arts and entertainment, and as a logistics and trading center in North America. What we don't see is a federal government, or the presidential campaigns, having any understanding of how it could assist metropolitan communities such as Detroit that are the hardest hit by the nation's move from an industrial to a knowledge economy. Katz and Austin stay on point and cover policy suggestions that fall under the purview of the Federal Government (e.g. international border policy). The problem is that they also reinforce the political silos that Richard Longworth reproaches as handicapping the Midwest's ability to cope with globalization. Getting the various Great Lakes issues on the national political agenda is a worthy cause, but the more important project is getting the region on the same page. Appealing to state-centrism is not helping the matter. The real work is the concerted and coordinated lobbying effort that needs to be done after the Presidential election is over. Any promises that Michigan or other Rust Belt states secured during the debates won't matter once the congressional squabbles over such items such as transportation policy begin in earnest. Cooperation across state borders is paramount to the success of any initiative dealing with the problems stemming from globalization. Youngstown State University unveiled the Postindustrial Urbanization and Globalization Institute (PUGI), the result of generous funding to be administered by the Council on Competitiveness. PUGI's mission is to build the new city of globalization from the established infrastructure of America's Industrial Heartland. The project seeks to "recycle urban resources for a global innovation economy." Youngstown will serve as the living laboratory for the first 5-years of research from which the next generation of US urban policy will spring. I sure hope that article title in The Sudbury Star didn't make the print edition of the newspaper. However, I'm not one to point fingers. I've misspelled Youngtown, OH on a few occasions. Getting past the belief that if we just have a "fighter" in the White House or in the Mayor's office, all those jobs will come back is an important step in moving forward. Look to the future not to the past. Midwesterners must embrace education and a different kind of education, one that is not based on mechanistic industrial values but on thinking and adaptability -- learning to learn. And then we must use our ingenuity and acquire a more entrepreneurial attitude (draw upon our immigrant pool with their much higher rates of business start-ups) toward our assets. The point of emphasis, obviously, is education. Longworth covers a range of issues that the Midwest needs to address and I'm tracking what appeals to various interested parties. A few of the Rust Belt Bloggers appreciate the call for better transportation links between the shrinking cities. Richard Florida also champions the idea. I'm cool on the prospect because I doubt such an ambitious project could get off the ground. The political geography is too daunting. Update: Check out this debate about a new community college in Erie, PA. Missing from that conversation is an understanding of how a community college can help a region cope with globalization. Our Forum on the future of our entrepreneurial community, "Where Do We Go From Here?" will be held on May 6th, 5:30 - 7:30 pm at the Rivers Club. There will be a social period providing time to network, and to meet representatives of many of our entrepreneurial support organizations, who will have tables around the room. Following this our panel of distinguished executives from Idea Foundry, Innovation Works, Pittsburgh Life Sciences Greenhouse, Pittsburgh Technology Council and The Technology Collaborative will field moderator and audience questions on the future of the Pittsburgh entrepreneurial community. The second set of policies that we must consider if we are going to address the shortage of scientists and engineers centers on our immigration rules for highly skilled workers. Today, knowledge and expertise are the essential raw materials that companies and countries need in order to be competitive. We live in an economy that depends on the ability of innovative companies to attract and retain the very best talent, regardless of nationality or citizenship. Unfortunately, the U.S. immigration system makes attracting and retaining high-skilled immigrants exceptionally challenging for U.S. firms. This situation has caused a serious disruption in the flow of talented STEM graduates to U.S. companies. Because an H-1B petition generally can be filed only for a person who holds a degree, when May/June 2007 graduates received their degrees, the visa cap for fiscal year 2008 had already been reached. Accordingly, U.S. firms will be unable to hire those graduates on an H-1B visa until the beginning of fiscal year 2009, or October 2008. As a result, many U.S. firms, including Microsoft, have been forced to locate staff in countries that welcome skilled foreign workers to do work that could otherwise have been done in the United States, if it were not for our counterproductive immigration policies. Last year, for example, Microsoft was unable to obtain H-1B visas for one-third of the highly qualified foreign-born job candidates that we wanted to hire. The United States will find it far more difficult to maintain its competitive edge over the next 50 years if it excludes those who are able and willing to help us compete. Other nations are benefiting from our misguided policies. They are revising their immigration policies to attract highly talented students and professionals who would otherwise study, live, and work in the United States for at least part of their careers. To address this problem, I urge Congress to take the following steps. First, we need to encourage the best students from abroad to enroll in our colleges and universities and, if they wish, to remain in the United States when their studies are completed. One interim step that could be taken would be to extend so-called Optional Practical Training (OPT), the period of employment that foreign students are permitted in connection with their degree program. Students are currently allowed a maximum of 12 months in OPT before they must change their immigration status to continue working in the United States. Extending OPT from 12 to 29 months would help to alleviate the crisis employers are facing due to the current H-1B visa shortage. This only requires action by the Executive Branch, and Congress and this Committee should strongly urge the Department of Homeland Security to take such action immediately. Second, Congress should create a streamlined path to permanent resident status for highly skilled workers. Rather than allowing highly skilled, well-trained innovators to remain for only a very limited period, we should encourage a greater number to become permanent U.S. residents so that they can help drive innovation and economic growth alongside America’s native-born talent. While some foreign students will undoubtedly choose to return home after graduation, it is extremely counterproductive to prevent them from remaining here to contribute their talents and expertise to our economic success if that is what they would like to do. Third, Congress should increase the cap on visas. The current cap is so low that it virtually assures that highly skilled foreign graduates will leave the United States and work elsewhere after graduation. By increasing the number of visas granted each year, Congress can help U.S. industry meet its near-term need for qualified workers even as we build up our long-term capability to supply these workers domestically through education reform. Ultimately, however, if we are to align our immigration policy with global realities and ensure our place as the world’s leading innovator, Congress must make additional changes to our employment-based immigration system. The current system caps employment-based visas − or “green cards” − at 140,000 per fiscal year. Because that number includes spouses and children of applicants, the actual number of visas available for workers is far fewer than 140,000. Moreover, the number of green cards issued to nationals of any one country cannot exceed 7 percent of the total number of visas issued in a given fiscal year. These two factors have caused multi-year backlogs for thousands of highly skilled individuals and are having a chilling effect on America’s ability to attract and retain great talent. I urge Congress to pass legislation that does away with per-country limits and significantly increases the number of green cards available in any fiscal year. Failure to do so will add to the already years-long wait for green cards and only encourage talented foreign nationals who are already contributing to innovation in U.S. companies to leave and take their talents elsewhere. Innovation is the engine of job growth; if we discourage innovation here at home, economic growth will decline, resulting in fewer jobs for American workers. I want to emphasize that the shortage of scientists and engineers is so acute that we must do both: reform our education system and reform our immigration policies. This is not an either-or proposition. If we do not do both, U.S. companies simply will not have the talent they need to innovate and compete. 16 United States Citizenship and Immigration Services Press Release, USCIS Updates Count of FY 2008 H-1B Cap Filings (Apr. 10, 2007) (stating that USCIS had received approximately 120,000 H-1B petitions subject to the cap as soon as petitions could be filed, and that those petitions would be subjected to a lottery to determine which 65,000 would be accepted and adjudicated), available at http://www.uscis.gov/files/pressrelease/H1Bfy08CapUpdate041007.pdf. 18 Vivek Wadhwa et al., America’s New Immigrant Entrepreneurs (2007), available at http://memp.pratt.duke.edu/downloads/americas_new_immigrant_entrepreneurs.pdf. You read last time how urgently we need Great Lakes city-lovers and livers to be loud about our assets, our needs and our strength in numbers. Apparently the Detroit Free Press agrees. In a recent editorial, Free Press editors made a passionate plea for mega-regionalism, reminding readers of the American South´s successful effort to do the same, changing the dynamics of electoral politics in the process. We could not be more excited about their call to action. Please urge you local paper to follow in the Free Press´s footsteps (see our Toolkit for a sample letter). The paper is also running a series of editorials calling for much-needed national focus on our urban cores. And the Free Press isn´t the only one demanding attention to urban issues in this year´s Presidential election. A New York Times editorial ¸although not regionally specific, recently argued for cities to serve as more than an occasional backdrop for Presidential politics. With the Pennsylvania primary fast approaching and Indiana not far behind, Great Lakes primaries will play a central role in the yet undecided Democratic contest. Whatever your party affiliation or candidate preference, don´t pass up the opportunity to make cities and not just any cities, our cities ­ matter this Presidential election. QUESTION: Do you think a Presidential Debate should take place devoted specifically to the concerns of Great Lakes States? Post your comments here. In early April, GLUE will hold the first of monthly meetings to take place simultaneously across the region. Any and everyone in a GLUE target city (Akron, Buffalo, Chicago, Cincinnati, Cleveland, Columbus, Dayton, Des Moines, Detroit, Duluth, Erie, Flint, Fort Wayne, Indianapolis, Lansing, Louisville, Milwaukee, Minneapolis-St. Paul, Pittsburgh, Rochester, St. Louis, Toledo, Youngstown) is welcome to participate. Although we will continue to use twice weekly "fireside chat" conference calls to share our mission and plans with the uninitiated, GLUE table meetings will get things moving on the ground. Strategize about upcoming events such as a summer weblaunch, as well as collaborate on articles for and projects of GLUEspace. *** Please note that just because your city is listed does NOT mean we have already organized a meeting there. That´s why we need your help! A complete set of instructions will be available on our website soon. We are pleased to announce a partnership with the Healing Our Waters--Great Lakes Coalition on their Healthy Lakes Healthy Lives Campaign. This summer, with the help of the National Wildlife Federation and National Parks Conservation Association, HOW will be sending the Earth Voyager on a cruise of the Great Lakes, stopping in the ports of many GLUE cities. Earth Voyager is a unique, 60' long, 40' wide trimaran with a mast that stands 97' off the water. Check out the Healthy Lakes Healthy Lives Tour site for pictures and more information. Each of these stops will provide a great opportunity to talk about invasive species, water treatment, toxic hotspots, green businesses, waterfront access, and how cleaning up our water makes good economic sense. In addition, it's a great opportunity to network with other non profits and gain exposure for what we´re doing. We´ll be using the tour to launch discussions about these and other water-related issues in each of our GLUE cities, and will help HOW showcase some of the wonderful things that we've stumbled across. If you´d like to be involved in planning the Earth Voyager´s stop in your city (anyone is welcome to help) and live in Milwaukee, Chicago, Detroit, Toledo, Cleveland, Erie, Rochester, or Buffalo, email Janice Littlefield at bythequay@comcast.net. Planning meetings are being held over the next two weeks in each of the above cities - so act quick! Project Olympus will be holding our 4th Show and Tell, Wednesday, March 26, 3:30-5pm in the 1st floor Lecture Hall of the Collaborative Innovation Center at Carnegie Mellon. A reception will follow at the Intel Lab upstairs. I hope you will be able to attend. Prof. Seth Goldstein (Claytronics Project), "The Future is Programmable"
Prof. Carlos Guestrin ( Select Lab), "Optimizing Sensing: from Water to the Web"
Prof. Latanya Sweeney (Data Privacy Lab), "Fast Capture of Fingerprints"
Jeff Mullen (DYNAMICS), "Eliminating Credit Card Fraud"
Matt Harbaugh (Innovation Works), "Launching the AlphaLab"
The article covers substantially more of Longworth's message, but the need for communities to band together is what resonates with me. Demographics continue to favor established points of view in the Midwest. I expect Rust Belt states and shrinking cities to continue to adapt to globalization in isolation. I don't think a few more success stories will make much of difference in the Postindustrial Heartland. The next stop in the Longworth book tour is Milwaukee. You can find the newer Pittsburgh in places such as the Monterey Pub in an old, federalist-style area called the Mexican War Streets District. Most of the under-35 crowd there was for Obama. One was Abby Wilson, a native who graduated from Columbia, worked in South Africa and then returned home to run a foundation dedicated, she said, to turning the "balkanized, dysfunctional cities" of the Great Lakes into a political force. "Obama can restore our diplomatic relations," she said. Over dinner in the back of the restaurant, she engaged in a debate with Web-site developer Brian R. Barcaro. A self-described Catholic conservative, his most popular site is Catholic Match.com. He's gotten buyout offers, he said, and gets hits from all over—but none, so far as he knew, from Polish Hill. Hillary Clinton appeals to Pittsburgh's old guard and Barack Obama is the voice of Pittsburgh's ongoing transformation. The same scenario played out in nearby Youngstown during the Ohio primary. Clinton used Youngstown as a backdrop to highlight the failures of NAFTA. What she ignored, apparently to considerable political gain, are the agents of change infusing the region with energy and hope. While I appreciate the more nuanced perspective of the region, Newsweek incorrectly identifies Mayor Luke Ravenstahl as the face of "newer Pittsburgh." Ravenstahl represents business-as-usual, quite different from the situation in Youngstown with Mayor Jay Williams. The deck is still stacked against fresh approaches to economic dislocation, at least at the level of local and state politics. If some different policies are to come to the fore, we will need to network and work across the traditional borders. Regional collaboration is the only way to break parochial gridlock. There’s still time to be a part of Digital Democracy, the 2008 Society of Professional Journalists Regional Conference on March 14-15 at the Omni William Penn Hotel in downtown Pittsburgh! Join journalists from across western Pennsylvania, Ohio, West Virginia, Michigan, and beyond as we explore how the digital revolution - including blogs, online video, websites and social media - is changing traditional news media coverage and citizens’ access to the political process. Hear speakers from The New York Times, Hearst-Argyle Television, J-Lab, NewsBusters, Media Matters, The Media Bloggers Association and more. Hosted by the Pittsburgh Professional Chapter, the conference includes a Friday night reception and Saturday full of conference activities, including the annual regional Mark of Excellence Awards banquet. Registration is affordable and easy via mail or online. Rates start at $65 for students and $85 for professionals. Register by March 10 to avoid a $20 late fee. A limited number of hotel rooms at the SPJ discounted rate still are available at the Omni William Penn Hotel. However, they will not last long. To book a room, call (412) 281-7100 or visit the conference Web site, spj.org/pittsburgh.